Banana Frozen Yogurt is a creamy, healthy, delicious treat that can be eaten for breakfast or dessert, or even as a midday snack! I fell out of love with frozen yogurt recently. I used to crave it every night after dinner. I loved ending my meal with something sweet and frozen yogurt always seemed ideal because it wasn’t super bad for you. I could fill my cup with fat-free, no-sugar-added yummy flavors and sprinkle on some toppings (obviously this part was indulgent because, come on, it is dessert after all) and be content. But it seems that I’ve grown out of this phase. I don’t ever crave frozen yogurt anymore. And you may want to sit down for this one — I never crave ice cream. I have a sweet tooth, but it’s for things like juicy pies and soft and chewy homemade cookies and brownies as thick, dense and fudgy as ever. I don’t know what happened to my love of frozen desserts — but then this happened. Frozen Banana. Pureed until so silky smooth it’s uncanny how much it resembles frozen yogurt. It’s nowhere near as thick as ice cream, but frozen yogurt? Yes sirree! I kept seeing it on Pinterest, but it took me a while to try it on my own. I’m kicking myself for not having done this sooner. 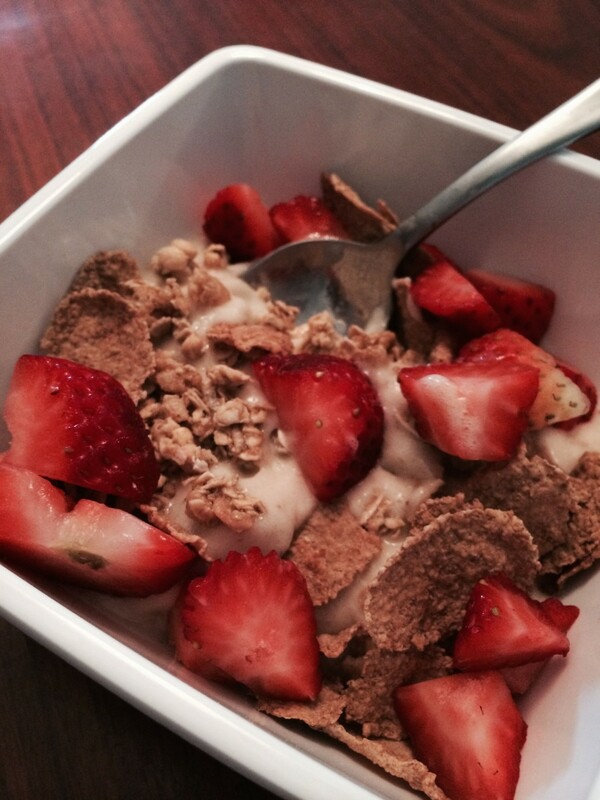 This has been one of my new favorite breakfasts piled high with berries and granola or cereal. It’s decadent enough that you can satisfy your sweet tooth but still healthy so you can enjoy it guilt-free. I still can’t believe that this can be achieve by simply slicing up a frozen banana and pureeing it to smithereens. Seriously, you do have to sit there with your food processor for a pretty decent amount of time until it gets to the consistency you want. Adding in cinnamon while you’re pureeing is a great way to add some depth to the flavor too. Plus cinnamon and banana is a flavor match made in heaven, so it’s kind of a no-brainer. I bet I know what you’re making for breakfast today! 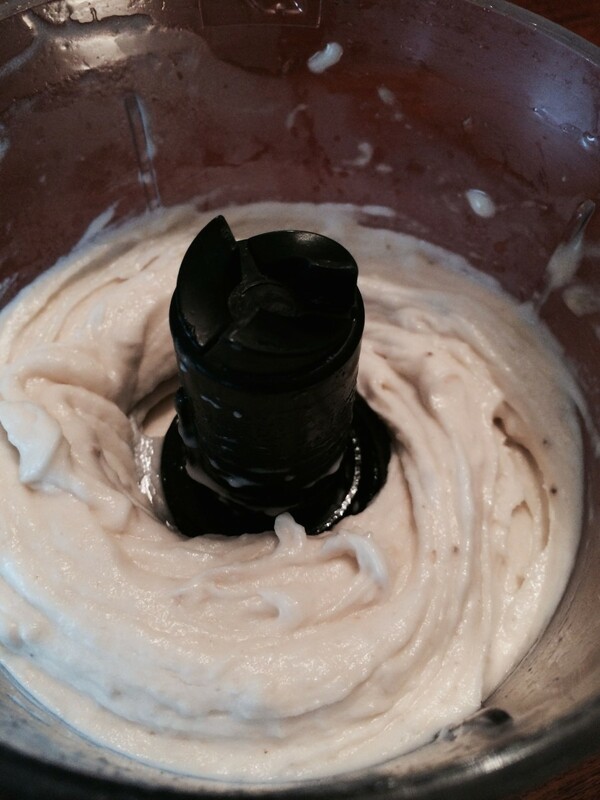 Place sliced banana in a food processor and pulse for 5-8 minutes or until completely smooth and creamy. Add the cinnamon and continue to pulse for another 30 seconds until cinnamon is dispersed throughout. Top with your favorite berries or cereal. 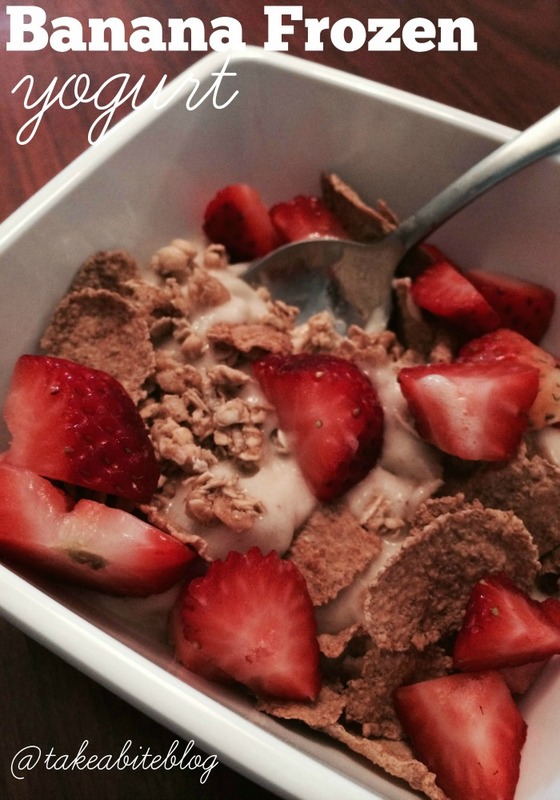 I need to shake up my breakfasts and this is a perfect hot weather recipe to try! YUM! Liz, it’s crazy how easy this is. I seriously can’t get over the fact that its just a banana! Wow, I can’t believe that this is only a banana. I am adding this to my breakfast recipe lists. I love bananas so I know I will love it. Thanks for sharing at Happiness is Home Made. I know right?! Thanks for stopping by, Bev! That sounds good, Kristen! I will have to try that next time! That does sound like a great way to start the day! I am terrible about eating breakfast, even though I know how important it is. I need to start. So glad you linked this up with us at Foodie Fridays! What’s great about this is that it takes almost no time to make and is SO easy. You’ll WANT breakfast now! Thanks for stopping by, Michelle! I’m doing a no-bake roundup on The Yuck Stops Here this week! When I saw that you had shared this recipe on In and Out of the Kitchen, I had to stop by and ask you to bring this one to our party too! Hope to see you there! HUGS! Stopping in from the Wonderful Wednesday Blog Hop. This sounds so healthy and delicious! Yum! That looks like a dream. I’d love to add some blueberries. Thank you for linking at the In and Out of the Kitchen Link Party. Hope to see you again next week. My kids (and I) love banana “ice cream” I should add cinnamon next time sounds yummy. Adding cinnamon brings so much flavor. I hope you and your kids like it, Debra.